ARG using ground penetrating radar to survey vertical rebar in the walls. There is always something that needs work in a 100 year old house, and Pittock Mansion is no exception. Several of the Mansion’s issues have been fixed in recent years. In 2009, the City of Portland corrected a structural failure that caused cracks in the marble threshold at the french doors and installed external copper downspouts to channel water away from the exterior’s sandstone. In 2013, we partnered with the City to restore the terraces and their balusters to stop water entry into the Mansion and maintain the terraces’ structural integrity and original beauty. To gain a complete understanding of Pittock Mansion’s restoration needs today, the Pittock Mansion Society Board hired Architectural Resources Group, LLC (ARG) to conduct a current assessment of issues and needs. ARG began their roof to basement survey in April, exploring the mansion’s many crawlspaces, utility rooms, and the expansive attic. 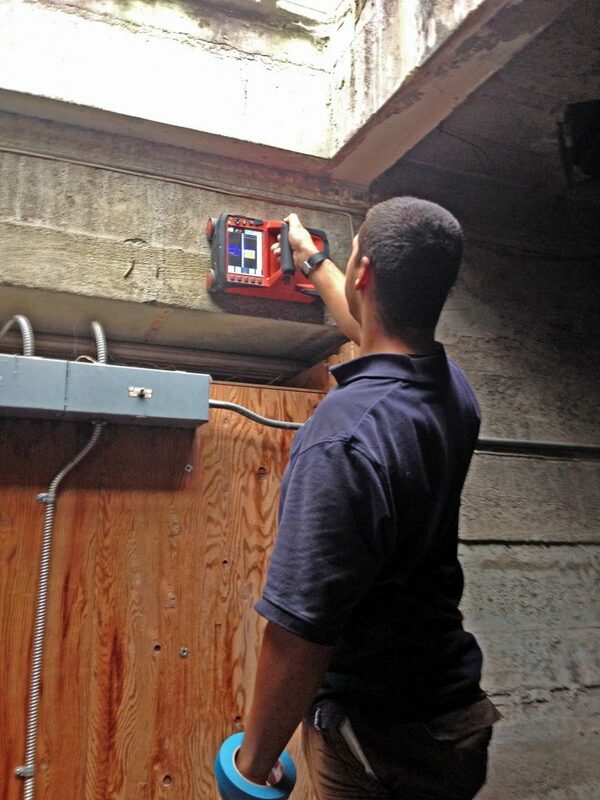 Some investigations require controlled removal of sections of pipe or cuts into the walls to obtain necessary data. ARG is probing in unobtrusive spots and skillfully repairing any cuts. Estimated to be completed by July, the final report will identify threats to the structure, treatment recommendations, preliminary cost estimates, and a suggested order of repairs. This document will be invaluable to the Pittock Mansion Society Board and the City when seeking funding and making long-term preservation plans.